Hey, i recently found a Landsknecht group in my area (maryland, eastern WV) and I need to put together a kit. I haven't seen pics of them yet, but i have seen many Landsnecht impressions. they seem to vary from the simplistic to the freakishly flamboyant (and a murder of a sewing project) what would probably be the easiest to sew? or buy cheaply. if anyone does Landsknecht, please post pictures. also, what armours would be good? im thining bout merctailors small pauldrons and B/B (already got B/B) also, footwear, does anyone know where to get landsknecht shoes for less than like, 200$? (USD) also, would a hand and a half sword work? pics of groups and individual kits are greatly appreciated. btw, would a landsknecht wear his elaborate clothing under armour? or is arming coat & gambo period? whatev. any other info bout putting together landsknecht rig is appreciated. thanks. While I can't really help with where to purchase period clothing or shoes, I can be of at least some help for the rest. From what you suggested however, if you decide on armor, Merc tailor is great. they're bergonet would be spot on for a helmet from 1525 and later. half armor would be best if you can find it, but in general it's not a necessity, most did without any armor at all. Also yes armor was more often then not worn over the usual clothes but would also depend on how complete the harness was. A longsword is also very possible, as there is various pictorial evidence showing long swords worn by men in virtually any position. check out lutel, I remember seeing various swords that would work perfectly for a landsknecht rig, as I bet they were made for it.
. best of luck with the kit, and hopefully someone will chime in for further assistance as I'm out of time. thanks, i was actually looking at lutel for my sword option. i was thinking doppelsoldner, but that probably would require a (too expensive) full -on 2hander. i love a zwie, but i just dont have the money at the moment. so, would a hand and a half require another primary weapon purchase? or would some use it as thier primary? I'll respond with some more a little bit later, but for now a few general things to keep in mind when joining a reenactment group. - I strongly recommend you check with the standards of the group you'll be joining before you make or buy anything, as many reenactment groups reserve the right to reject an item from your kit if it does not meet their standards of authenticity. This does not mean they're rejecting you, just requesting you spend more time researching and acquiring more appropriate gear before you present it before the public as being accurate. -Do a ton of research, if its not free, its cheap. Primary sources (wills, inventories, artwork from the time period, etc.) are best, but remember to cross-reference a variety of those sources to ensure you're getting the best idea of what was worn or used and to get around any bias' the work's creator might have had. Be sure when looking at artwork to note whether or not its a scene intended to depict "real life" or serve as social record or an allegorical/Biblical/mythological scene, in which elements might have been skewed by the artist to look foreign or from antiquity. Also be sure to find out what decade or year your group is portraying, as fashion changed quickly then too. -Prioritize! What comes first in your kit? Good quality, accurate clothing or flashy armor? Shoes or a dagger? Period eating gear or a sword? Sometimes you've got to get the mundane stuff before the fun stuff, as it serves as a foundation upon which to build the rest of your kit. In any case, before you spring for armor- as many Landsknechte were humble laborers, I'd go with clothes and shoes, then accessories (eating ware, everyday items, etc. ), then a sword or knife, and armor absolutely last. (Of course this all depends on the direction of your group). Here are some vendors I've found over the years that offer a relatively inexpensive kuhmahl - one of the most well-known sorts of shoes worn by the Landsknecht. I can't speak much for their quality, but I've heard very mixed things about both companies. Best of luck and have fun!!!! To help you with your it is necessary to know the exact time you are planning to reenact. Clothing style varies each decade in the 16th century. The shoes worn and even the armour and the weapons change slower but there are clear varieties. A "Langschwert" is not realy an option for a common german Landsknecht because it is associated with the swiss soldiers of the time and these two groups where enemies (see the picture "Reisläufer und Landsknecht" by Nikolaus Manuel Deutsch 1529). I know just a few seldom pictures of Landsknechts wearing a sword that could be a "one and a half" and all of them are 1550 and later and schowing officers. A sword is not the prime weapon for a Landsknecht, it is a side weapon. It is called "kurze Wehr" ("short weapon") and serves as a back-up weapon. The prime weapon ( called "lange Wehr" which is maybe "long Weapon") for the common infantryman is long spear. Only the "Gemeinweibel" is allowed to wear an halberd which is also called "kurze Wehr". The Doppelsöldner was not only a double paid mercenary because he was wearing a Zweihänder as a prime weapon but also because he was wearing heavy armour. Maybe it is an idea to start with the clothing and a basic kit and then improving it when you have the money. Herr Pfeifenberger, I would agree with pretty much everything mentioned so far. Swords as a general rule served as a sidearm or secondary weapon to a primary weapon such as a pike, halberd, boar spear, etc... But with the exceptions of the doppelsoldner with the Bidenhandschwert, and technically Pfiefers/Trommlers and standard bearers (though armed mostly for self defense purposes). Secondly, while it is as you say officers and lieutenants sometimes used halberds, there is plenty of evidence in the form of art work of troopers who bear halberds along with the pikemen, though they are minority by comparison. I also must disagree with the statement that longswords were used only by the swiss. I would think that the average Reislaufer was no more richer than the average Landsknecht nor did he fight much differently than his German nemesis to promote using a longsword over a one handed sword. There's lots of pictures showing various landsknechts bearing longswords just like for the swiss, Ive seen them held by lieutenants, arquibisiers, Doppelsoldners (with also a two handed sword to boot), heck even by aforementioned Pfeifers and Trommlers. Wealth and social disposition certainly play a major role as to ones position in the Fahnlein as it did in any position on a given battlefield. And here is a Speisstrager, armed with a pike and a longsword. I have been doing Landsknecht reenactment and portrayal since 2004 and have done a lot of research into the "Golden Era" of the Landsknecht periods. There three main eras: early, middle, and late. The middle era is considered to be the "Golden Age." The early period is when Landsknechte were first raised, approximately around the 1480s. Their clothing was more tight and you often see their ties undone or loose. The "Golden Age" was around the 1530's because they carried the glory and styles from the battles of Pavia and the Sac of Rome from the 1520s. During this time, we see tight pants and big sleeves. The late era is around Elizabethan times and the Landsknechte wear tight sleeves and big pants (pluderhosen). Most of the time during the early and middle periods (I can't say much for the late period because I didn't study it very much), the common spear-carrying Landsknecht soldier came from a lower, working class. They were poor enough to be lured by the pay of a soldier but were also expected to buy their own equipment; therefore, you, as a reenactor, are presented with the same financial burdens that a Landsknecht was presented with. To get into it, you need to spend money you may or may not have. This determines what equipment you will carry. It is for this reason that a lot of Landsknechte did not wear armor. Those that do wear armor often wear just a mantle of maille over their shoulders or a leather doublet as a protection from nicks and cuts (because poor protection is better than no protection at all). Landsknecht armor a lot of times had that "beer gut" shape to it so pike thrusts would glance off. The "black and white" armor came out around the late period. During all three time periods, Landsknechte usually were seen with a quarter harness: covering the torso and head. The arms were sometimes covered. Like I said, armor was and still is expensive. Most Landsknechte fought with very little armor. The common side-arm was a Katzbalger: a short sword with a hilt in the shape of a figure-8 or an S. The swords are short because, when two pike squares come together, you have no room to swing around a longer weapon. This was called the "Bad War" because the chaos was brutal and terrifying. You will see woodcuts or examples in museums of longer katzbalgers, which definitely existed. However, the munitions-grade swords were much shorter. I believe that Graz has a munitons-grade armory that exemplifies this well. 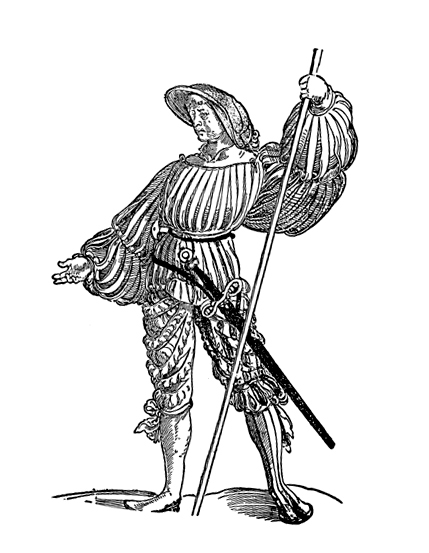 The elaborate zweihander, with the parrying hooks, wavy blade, and other fancy detail, is often not seen in depictions of Landsknecht at war. I can think of perhaps only one woodcut with this weapon. I can definitely say that it would abnormal for such a weapon to be used by a Landsknecht during the early period or the Golden Age. More common is a simple, big two-handed sword, which I refer to as a bidenhander. It has a straight blade, an S-shape or figure-8 quillon, and a simple pommel. This would be carried by a Doeppelsoldner, but it was far more common for a Doeppelsoldner to carry a halberd. They're cheaper and just as effective as the big sword. I started out my Landsknecht reenactment just like my character: poor and from the ground up. First I got my garb, then I worked towards my katzbalger, then I acquired a maille mantle, and I later bought a breast plate that covered only the front of my torso. This has taken years, but it reflects what my character would have done as well, provided he didn't die in campaign. The life-span of a typical Landsknecht was about 6 months. For patterns and sewing, the assembly is not difficult. The patterns, however, are difficult. If you buy a pattern and then alter it to fit your body properly (a navel-high waist and tight in all the right places), it will look right and it won't be a difficult project. The perceived complexity comes from the slashing. You can find patterns from Reconstructing History. Everyone seems to agree that the patterns are great but the instructions are not very good. Once you have them explained, the project will go from hard to not hard. The pictures I attached show the progression of my kit over the years. The black and white armor I am wearing is out-of-period for my garb. I depict a Landsknecht from the 1530s and the black-and-white armor didn't show up for a while after that. It is something that I need to fix when I can. Thanks for the pictures, craig. theyre very helpful. ive already purchased a breast/back, and im thinking of buying a bishops mantle and the small pauldrons. (all 4m merctailor) and the lutel longsword is quite expensive (but a good value nonetheless) so ill purchase that later. hey, another point, (excuse the pun) would a landsknecht have arming points on his clothing? because thay would often wear a bishops mantle, which im assuming wasnt worn w/ a gorget to buckle onto. You can get away with tying your pauldrons to your mantle, but I think that if your life was dependent on it you'd have arming points. Or at least have points for the mantle because they'll flop over your face if you fall. Mantles are very comfortable though and I believe they used them in lieu of a steel gorget. Craig: Looking good! Is that one of Moffatt's black and whites you're wearing? The common landsknecht pikeman was flamboyant for his time, but in general he didnt have acces to fabrics like silk, damask, brocade and velvet, and his dress as a rule was limeted to two or tree colours. There's a kit four posts from the bottom you may be interested in. Someone with more knowledge on the subject may have to verify the accuracy of the kit though. I have been skimming through the armourarchive thread, and some of the links provide pictures of Landskecht in hose w/o plunderhosen. would this be accurate, possibly for an early landsknecht? and if so, how long was this something landsknecht wore? Plunderhosen are characteristic of later-16th century landsknechts. Second half of the century, iirc.